Friday February 5th 1892 I got the work done in time to do a little mending before noon. Will took me over town in the afternoon. I did a little shopping before going down to Hatties. Mother feel very much better. I worked on the lace. Saturday February 6th 1892 Will went after Mother before noon. I dressed a turkey and done some baking this forenoon. Josie went home before dinner. I did some mending after the work was done in the afternoon and worked on my lace in the evening. It began raining about four oclock. Sunday February 7th 1892 It was a rainy nasty day. Mother and I were all the morning roasting our turkey and getting dinner. We read all afternoon and Will and I spent the evening up stairs reading and writing. Monday February 7th 1892 I walked to town this morning. It was pretty cold. I was down to Hatties. Ott and Fanny came home last night. I am having my teeth fixed. We had a long letter from Charlie this morning. I put in all my spare time in making edging for Hattie. Tuesday February 9th 1892 I was busy about the work all forenoon. Will took me over town in the afternoon to get my teeth they are very satisfactory. I was down to see the girls a little while. We all went to the play in the evening and enjoyed it very much. 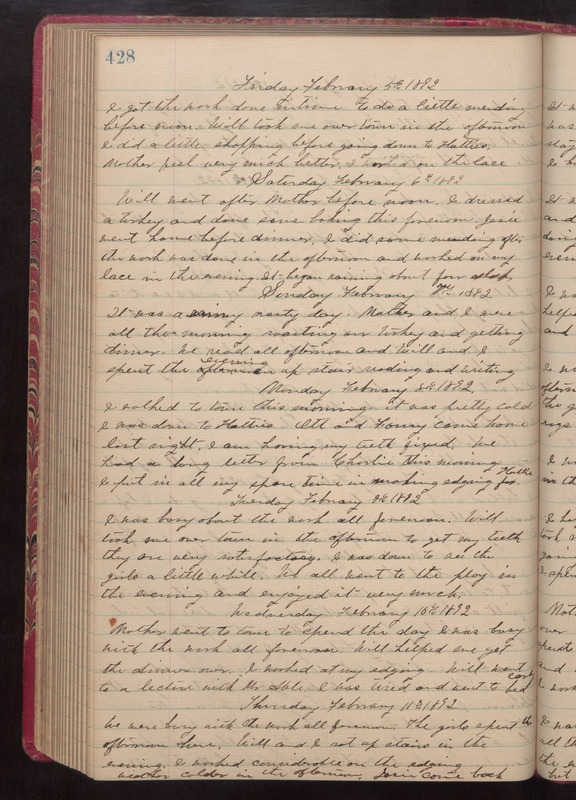 Wednesday February 10th 1892 Mother went to town to spend the day. I was busy with the work all forenoon. Will helped me get the dinner over. I worked at my edging. Will went to a lecture with Mr Able. I was tired and went to bed early. Thursday February 11th 1892 We were busy with the work all forenoon. The girls spent the afternoon here. Will and I sat up stairs in the evening. We worked considerable on the edging. weather colder in the afternoon. Josie came back.